Saving & investing money regularly is key for achieving financial success. Most of us know this golden rule but very few people follow this rule. 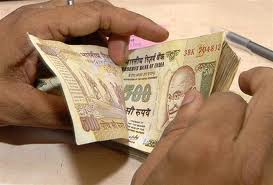 When it comes to investing money many people has question in mind where to invest money? Or which investment option is best? Today we have more than 20 Investment options. 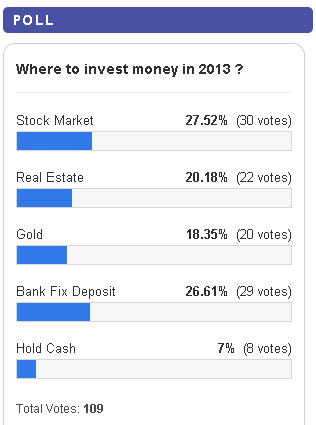 To reduce your anxiety we have started poll/survey on our blog “Where to invest money in 2013”. Option given was “Stock Market, Real Estate, Gold and Bank Fixed Deposit”. We have received extremely good response from users. Total 109 users have participated in this poll. As per current poll result Stock market is winner with 27.52% -30 votes. Fixed deposit is on second number with 26.61% – 29 votes, Real estate is still holding charm with 20.18% -22 votes. Surprisingly Gold is losing its shining with 18.35% -20 votes. Where to invest money in 2013 ? As stock market is winning the race we are herewith another poll asking end user about “Best Stock for investment in 2013”. We have selected options for this poll based on our wisdom but here user are allowed to enter their own option also. « NHPC PFC & IIFCL Tax Free Bonds Comparison: Which one is Best?